The Zambia National Building Society ( ZNBS) has now made it mandatory for people renting It’s houses to open bank accounts with ZNBS. 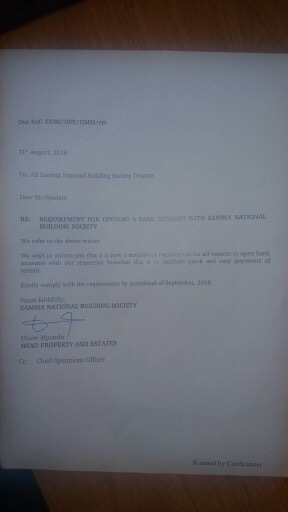 All ZNBS tenants are required to open these accounts by September month end or they will be evicted, according to notices signed by Oliver Mpundu, ZNBS director for Estates and property. No more freedom of choice as to where you want to keep your little earnings.